My guess is that the makers of the DVD have the later, edited, masters, and not the originals - if they still exist. I don't think these cuts are down the DVD makers at all. Hi ? I wonder if you can help us? We?ve just been alerted to the fact that there may be some small edits in a few of the Follyfoot episodes we?ve recently released on DVD. To say we?re alarmed is an understatement as we went to the extra expense of getting most of the episodes from the first two series especially transferred from the original 16mm film elements so that they could be presented in the best possible condition. Given this, are you able to supply me with a list of what you believe has been edited and what you compared the DVDs against to arrive at that conclusion? That way we can go back to the licensors and ask them what happened as we should have been (and took it on faith that we were) supplied complete and uncut versions of each show. Hah! I see I'm on that thread as well posting the same as the one above. Sorry about that! Well, it could be as simple as someone took the wrong cans down from the shelf. This does happen. One of Kate Bush's early tracks got released on a compilation when someone at Abbey Road took the wrong version down. Let's hope this is what it is, at least it might be that the original full length episodes survive. Do we know if Network ever got any straight answers from the "licensors"? Do we know if Network ever got any straight answers from the "licensors"?? I don't think we ever heard anymore about it, which is a shame. Certainly no one from Network has ever come onto the forum and said anything that I can remember anyway. ?Maybe after Howard has completed his research on the missing scenes, Network could be contacted and given the list, which is what they were after I believe. ? I'd say that we should certainly do that. Looking back at the thread, it seems Louise was in contact with 'Steve' from Network, but due to issues we had with the site at the time, they were unable to log back in to check up. We didn't have a lot at the time, but now Howard is compiling a very thorough (and frankly rather shocking ) list of the cuts I'd think Network would definitely be interested. It looks like they were kinda ripped-off . I don't know who the current licensors would be - a legal shell of Yorkshire TV still exists, but in effect all its operations have been transfered to the central ITV plc. It may be doubtful if when Network were in contact with "the licensors" that the latter were even aware at this stage (30 odd years later) that two versions existed. Whoever had to pull the cans from the shelves may not have known this. It may just be an unfortunate chapter of accidents. "The answer from Granada was that they supplied us with transfers of the best available materials. When we queried the cuts made with the details supplied by Barney and several other people, we were basically told that there was no real way they could have been aware of such small cuts in programming which is nearly forty years old, without comparing every single available print to determine which was the longest, which would obviously be prohibitive." I don't agree - it doesn't matter whether a series is four or nearly forty years old - Network advertised the series as "complete and uncut" which it obviously wasn't. As next year is the 40th anniversary of Follyfoot, we need to contact Network and convince them to produce a re-mastered or Blue Ray boxed set, complete with up to date interviews with the actors.? (Network have just released a 40th anniversary boxed set of Catweazle, which was made just before Follyfoot).? They could also include the documentary "Lights, Camera, Location" which was filmed at the Follyfoot location, and shown in the Yorkshire Television area in 2008, as well as including all the incidental background music.? I have already pre-ordered my copy!!!!! "Dreams come true when you want them to, If you want them to, then it's up to you"! Thanks for the info Barney. It does rile me that the series is advertised as "complete and uncut" when it most definately isn't? Very interesting Barney and I totally agree with you. 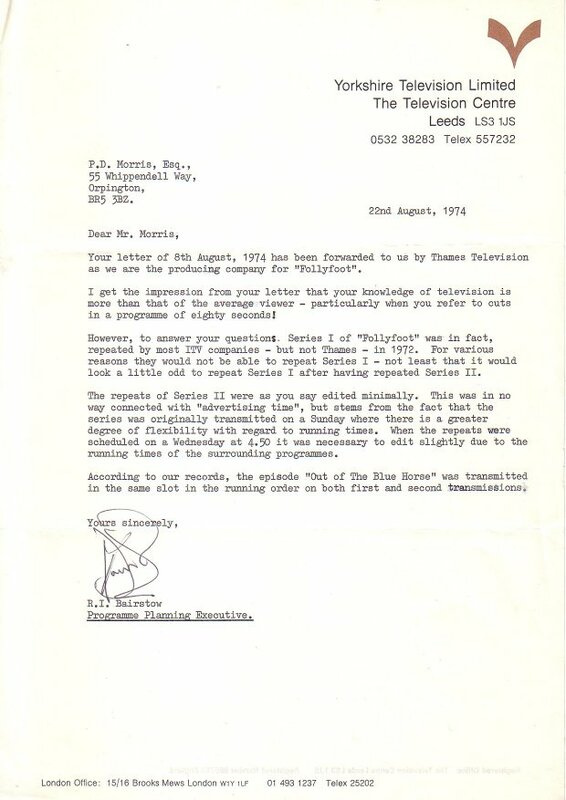 It seems to me that with hindsight perhaps dedicated FF volunteers could have been allowed to jointly assist/examine the full tapes alongside Network and Granada and then all aspects of missing scenes would have theoretically been included with the fans seal of approval. Possibly costs may or may not have gone up bt it's the principle. Well done to Howard for bringing this out as an important topic. Hi, I have just been reading Nik's history recaps of the whole site & the battle to get the series into DVD, I am very impressed by the groupwork here! Shows you can make an impact & change the world. Dreams come true if you want them to! Well, presumably Granada (=licensors) were taking money for the privilige, so they should have done the job properly. Others knew about the edited versions. As next year is the 40th anniversary of Follyfoot, we need to contact Network and convince them to produce a re-mastered or Blue Ray boxed set, complete with up to date interviews with the actors ...?They could also include the documentary "Lights, Camera, Location" which was filmed at the Follyfoot location, and shown in the Yorkshire Television area in 2008, as well as including all the incidental background music ...? Would be an excellent idea. Especially the music. Though I guess they would probably have similar problems again in locating the original masters. The Complete Series 1-3 on dvd... are they or aren't they? Was just looking over the slipcase for my FF dvds and noted it reads "6 disc set, all 39 episodes, complete and uncut." Wondering if this is true as I never saw the original broadcast versions and would have no way of knowing if scenes have been cut. Is there any sort of identification on the case or the disks verifying these as unexpurgated episodes?